As a result of the changing and more demanding environment for duty of care, there is the need to improve the facilities for the evacuation of disabled, injured or incapacitated persons from public premises. Power Systems International in collaboration with the Local Government of Cambridgeshire County Council have embarked upon a pioneering initiative to provide purpose built ELPS standby power systems for dedicated emergency evacuation lifts to be installed in schools, libraries, hospitals, and other public buildings. Now with 10 years experience in this sector, we have dealt with many projects all with their own unique local factors, so we are well versed in dealing with the probelms of a particular project. The Evacuation Lift Power System (ELPS) can be used on any dedicated lift (elevator), whether traction or hydraulic. The unit is cost effective and eco-friendly as it uses little energy in quiescent mode, consuming only 250 watts of electricity. In comparison to a conventional uninterruptible power supply (UPS) of 20kVA that would have losses of 2 kilowatts. It is estimated that the running cost for a 2kw fire is 29p per hour!!! In a year that would be up to £2,500 per year savings from an ELPS when compared to a standard UPS! Over the life of the unit that could be in the region of £25,000. This is quite a significant energy saving and thus has excellent ‘green’ credentials. But even more important as the unit stays in stand-by, it keeps the batteries fully charged, and clients such as the University of Cambridge, have been removing standard UPS Systems, as they have been failing after a few years, meaning that they need to be replaced. The ELPS is designed purely for this purpose, designed to handle the variable loads of a lift and designed to work when it is needed! 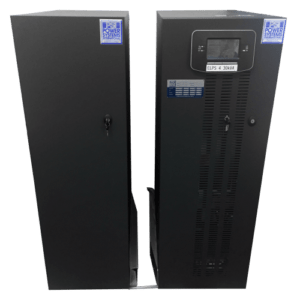 The ELPS unit is a compact standby power system built in a steel enclosure comprising a high performance intelligent rectifier battery charger, maintenance free battery and a PWM inverter with integral output transformer for galvanic isolation. An automatic bypass feature is also provided. In an emergency evacuation situation or when the public power supply fails, an authorised person controls the ELPS from the externally installed switch by using a remote control key, like the ignition switch in a car. The “emergency power” switch is usually installed adjacent to the call button for the elevator or on the control panel in the lift car, and once activated powers the lift (elevator) hoisting system from its internal inverter and batteries independent of the mains power. The “on emergency power” button at the control point illuminates to signal power is being provided to the lift (elevator) traction system from the ELPS system. It is then possible for the authorised person to operate the elevator for a prescribed number of journeys which can be as many as 10 upward and 10 downward journeys within the one hour period as stipulated in the EN-British Standard specification (BS9999). Longer runs can be designed in, for example 2 to 3 hours, where required. A summary alarm signal is also provided for connecting to a building management system. The ELPS evacuation lift power systems comply with the relevant BS, EN and IEC Stansdards specifications and are specifically designed for use with lift (elevator) hoisting systems fitted with VVVF traction drives and three phase induction motor driven hoisting systems as supplied by OTIS, Schindler, KONE, Mitsubishi, Oakland, Stannah, Thyssen, and many more lift manufacturing companies. Our customers include Schools, Universities, Hospitals, Care Homes and Public Buildings. The ELPS product can also be supplied for the hydraulic lift hoisting mechanisms using three phase induction motor driven pumps and for lift hoisting systems where reverse energy recovery is required.